The Primitives opened a chapel in 1819, replaced by a new chapel in 1830, and enlarged in 1855. The KENDALL MEMORIAL CHAPEL was opened in 1885 and was closed on December 1960, and demolished in 1962.This commemorated the contribution of the Kendall family, but especially of Thomas Kendall. H.B. Kendall writes in the two volume history of the History of the P.M. Church of Thomas Kendall, a cottage-farmer of Ashby, “Going to Messingham one evening on business — William Braithwaite was that evening conducting a service at Messingham, and Thomas was somehow drawn to the place.” Convicted of sin he then heard Hannah Parrot at Crosby. So he caused a chapel to be erected. The Chapel was built on the High Street in 1826 in honour of Thomas Kendall & family, but in 1828 the congregation were evicted because of no title to the land it was built on. The next Chapel was built on Bottesford Lane in 1830, replaced back on High Street in 1885 with title. It was closed in 1960. Scotter PM Circuit 1826-1932/3, etc. Ref. Meth/C/Ashby, Kendall/A/1/11: Register of Marriages 1916-1932/7 (Note: Can not be viewed or transcribed until year 2022). Ref. Meth/C/Ashby, Kendall/C/2/1: Trust Account Book, Minister’s House Trust, 1909-1914. Joint Chapel, School & House Trust, 1914,etc. Leeson Petch, was first cousin once removed to the KENDALL brother’s through his maternal line Charlotte Storr, her mother Mary being the sister of Fanny DENNIS, their father being Leeson DENNIS. You can read more about the Ashby society in the story of Leeson Petch, a local preacher and society steward at Ashby. My parents were married here in 1946. 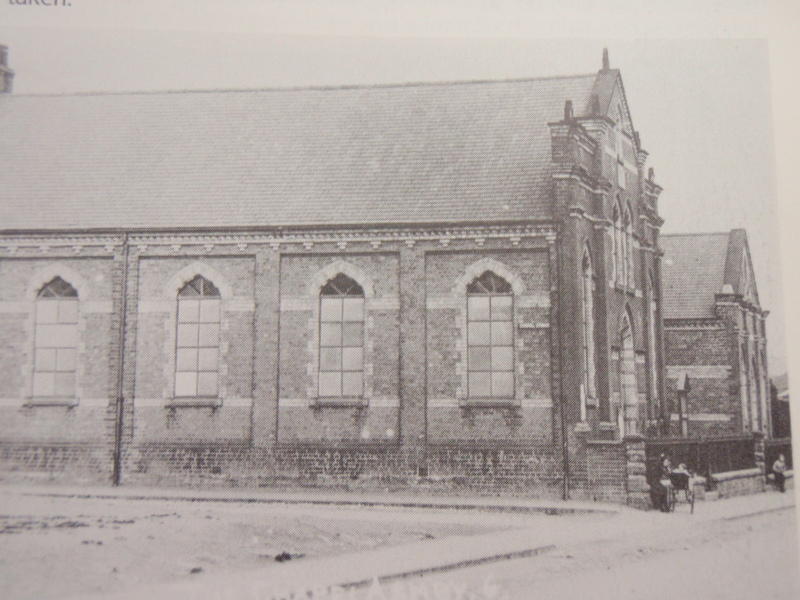 The Kendall Memorial Chapel was situated where Ashby Market now stands. The opening sermon was preached on Sunday 2nd February 1885 by Rev. Holliday Bickerstaffe Kendall [grandson of Thomas] representing his deceased father Charles. The next three consecutive Sunday’s sermons by brothers Dennis, Joseph and Henry were conducted. The building in the foreground is the schoolroom added in 1893. I understand the Kendall Memorial Chapel stood in Ashby High Street, Ashby, Scunthorpe, which does not seem to be clear from its description on the site? I wonder if the book published about the Kendall family, who were so closely associated with the chapel, is still available?